The filming of the new CURVE and LUMOS took place on the 14th April, and should be fully available on the website by the 30th April. 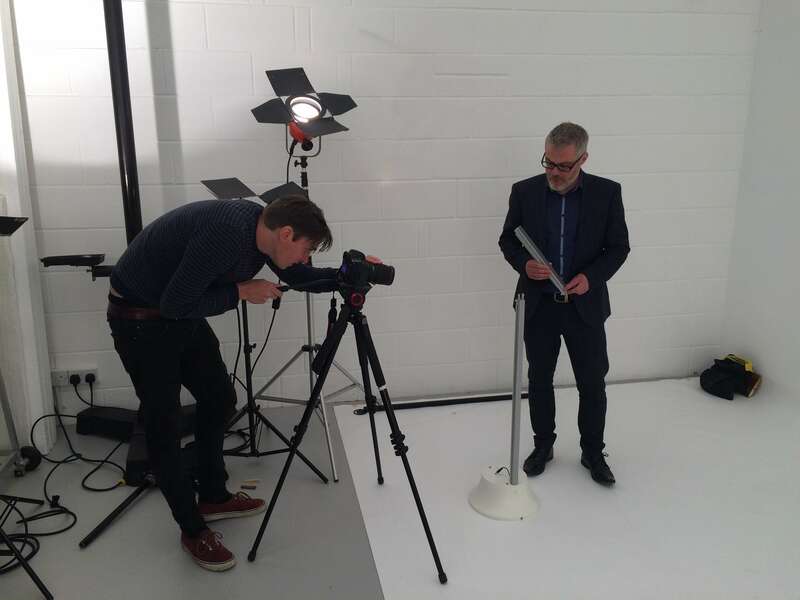 As with TWIST, these films will offer unbranded comprehensive step-by-step visual instructions to aid the selling process. Breaking into the US market is never an easy task, but we have done just that by wowing judges at an internationally renowned exhibition in Las Vegas to win one of the most coveted awards of the show. The New Curve was one of 40 entrants in the New Product Showcase, and thankfully it impressed the judges that we were awarded the ‘Best Buyers Choice‘ of the exhibition. 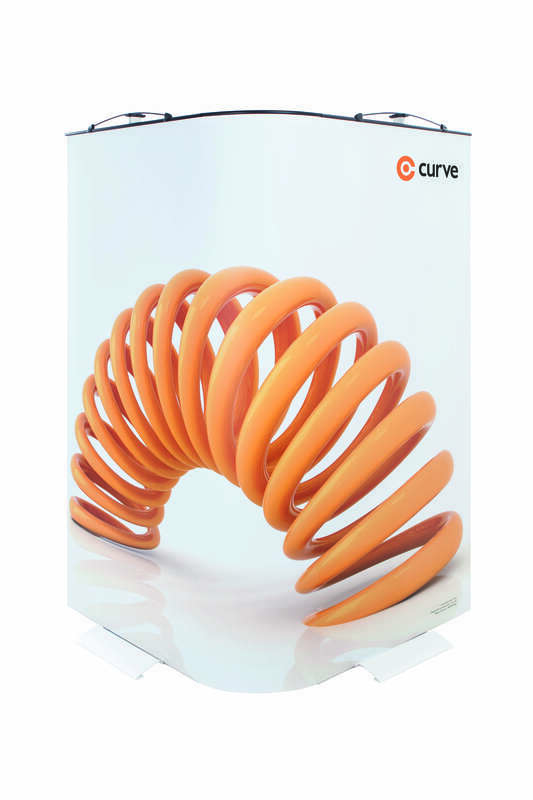 Introducing the exciting new CURVE display system. Made and sold directly from Eve, a standard 3-panel CURVE flexi kit fits into a unique lightweight transportation case that when fully packed with hardware and graphics weighs just 12 kilos. Come & see us on the DISQ stand B190 at Marketing Week Live, 25th – 26th June 2014, Olympia, London – Look forward to meeting you. A new double hard case graphic template is available to download from our site. We have improved the tolerance in the graphic ensuring a snug fit every time two Twist hard cases are used back to back to create a double case counter conversion. Click here to download this PDF template directly. The Latest 2014 Cad Brochure is now available to download and its now even easier to find the best Twist configuration for standard shell schemes, space only and island stands with our new interactive PDF. Click here to download your copy today. Following our recent re-branding project, we are pleased to announce our new unbranded collection brochure is now available to download. Offering clear concise information in a “lifestyle” format, each of our unique products now have their own visual identities, that we hope will appeal to a wide range of customer. Click the cover to download your PDF copy today. The new Curve bags have arrived, making the Curve even easier to transport. Each bag holds a stand, one main graphic, one Flexi-link graphic and a set of Easi-links and weighs just 7.5 kilos. At no additional cost the Curve 3 panel kit hardware still just £139.00. Eve attended FESPA under the DISQ umbrella and had great success with the LINK roller banner. Showing it to the export market for the first time the worlds first true seamless linking roller banner was demonstrated almost continually over the duration of the five day show. Interest was shown from many European markets including Germany Spain and Italy as well as North and South America and the Far East, all looking to differentiate themselves with new product lines. Introducing a great free Sales tool for any Eve Products distributor/reseller, now complete with our new category listings for our new Lumos, Connect, Curve and Link products. Our new web application is completely free of charge and allows you to create your own stand layouts. 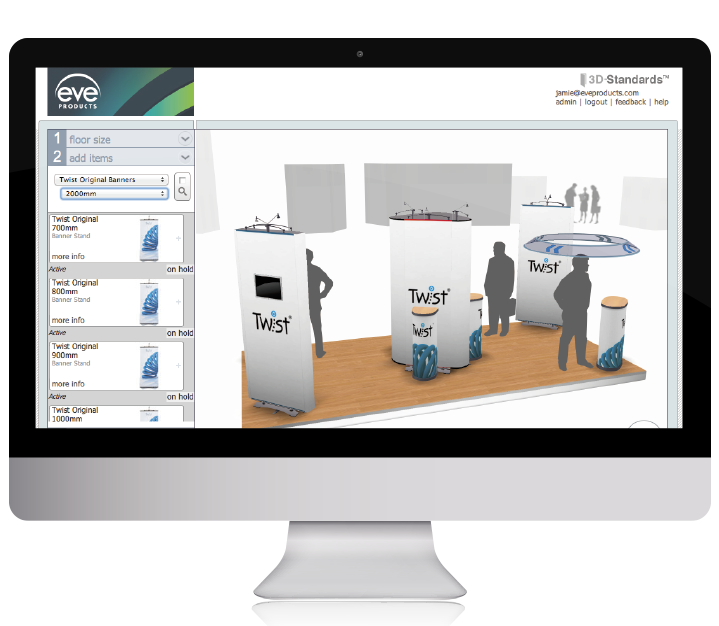 Simply set your exhibition stand floor space, graphic height and drag and drop any product from our new category listings to create endless configurations. Further additional features to enhance any design include; uploading dealer/customer artwork, changing floor coverings and adding people or furniture. Create a free account to save any designs and upload your company logo onto the homepage. You can even create a PDF of a completed layout and email it direct to your customer!